Now a resident of Indian Harbour, Barbara reflects on her childhood – a much different time and environment than the seaside playground she now calls home, “As a child growing up in Scotland during WW II my father built for my older sister a large lighted dollhouse bungalow from scratch which was rebuilt to a lighted 2 storey model and was passed down to me, my younger sister, my niece and great niece. 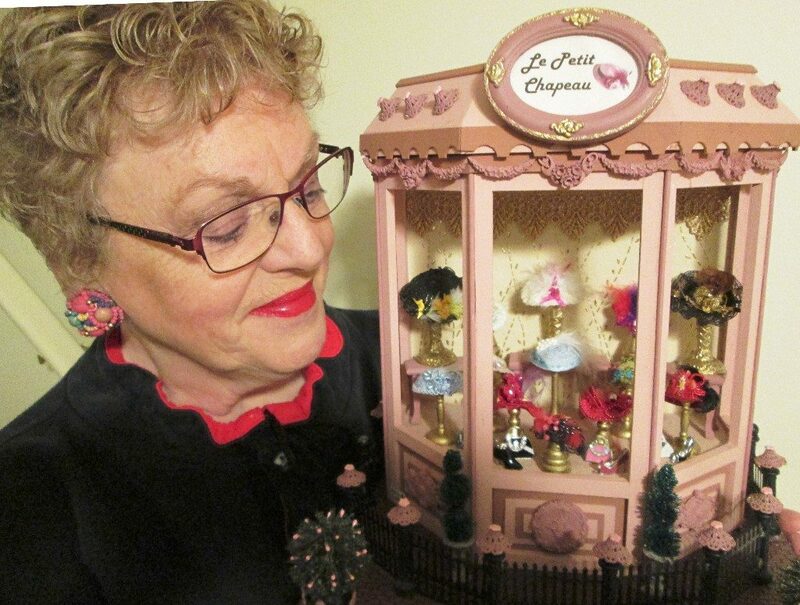 I remember escaping into this miniature world, creating a life for the 5 dolls who lived there.” This memory has since translated to Barbara’s signature artworks – her “miniature moments”; 1/12th scale (1” = 1ft.) pieces. When I asked Barbara about (what I call) her “thing” – the place or feeling inside artists that inspires creativity – she described this space as “a combination of imagination and artistic inspiration to create ‘Miniature Moments’ in times that are happy, historical, sad, thought provoking and amusing that challenge my creative juices”. Without formal training, Barbara has sought escape and relaxation in the creative process, learning skills and techniques on her own. Her first miniature project came in the form of a kit. A Christmas gift that would prove to light a spark, keeping new ideas burning for more than ten years now! It was at a PCAFA event that through conversation with a fellow member, Barbara explored the idea of calling herself an “artist”. A term that many of us, perhaps particularly those of us who are self-taught, have to mull over before finding comfort in confidence in this title. Using a culmination of research, gathering of numerous materials, replicating full size objects such as food, flowers and animals into miniature counterparts, Barbara is a tried and true artist! Barbara’s next project will be working on creating a setting called “The Unexpected Visit”, for the 5 original dolls that lived in the dollhouse from her childhood. It’s amazing how our “thing” can speak to us from the very beginning of our creative curiosities.